Travel with me back in time to 1993. IBM made Hard Disk Drives – some of the best on the market. They manufactured one line of drives that were marketed to home retail customers under the “DeskStar” brand. All went well until 2001, when drives started dying without warning. The failures were so bad that PC world dubbed the IBM DeskStar 75GXP the 18th worst tech product of all time. Throughout 2001 and 2002, they continued to fail at such a prodigious rate that some wag started calling them “DeathStars”. The name stuck. By a curious coincidence, IBM got out of the Hard Drive business in 2003, selling that part of their business to Hitachi. Hitachi continued selling DeathStar… er… DeskStar drives, and they do to this day. 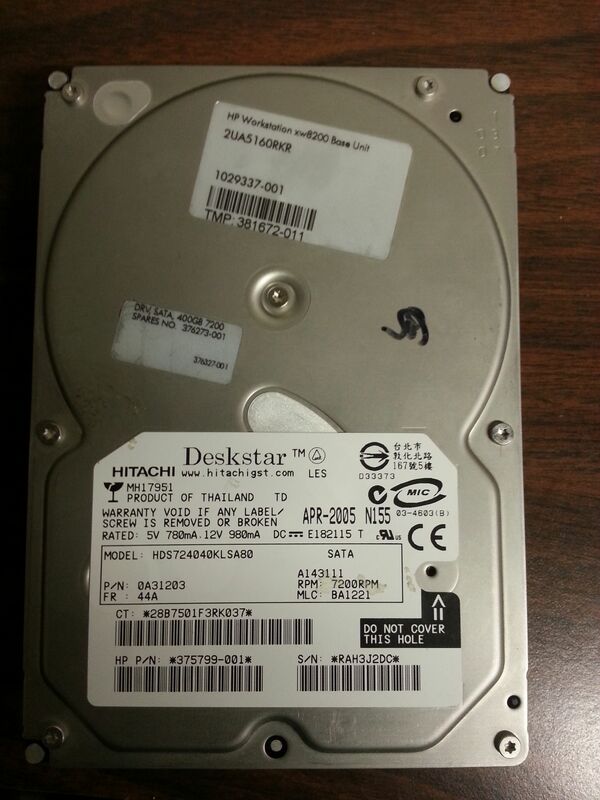 Many years later, I acquired a 400GB Hitachi DeskStar drive. It just failed. No warning, no SMART errors to alert me to impending failure. No chance to take that one last backup. Hard Drive failures are rare in my house; all of my machines get clean power from UPSs, and most are left on much of the time to minimize thermoelectric stress. This particular driver was the second drive in the system, so it wasn’t the boot drive and did not do any heavy lifting; it was mainly used for archival storage. Fortunately it did not have any vital data on it; until a few months ago, it was the sole repository for all of my stored TiVo programs, but I moved them to a dedicated Home Media Server earlier this year. But it is still annoying that I could be so easily caught flat-footed my technology failure And the moral of this sad story is that S.M.A.R.T., which was designed to prevent exactly this scenario, still doesn’t work. Never install anything that you did not go looking for. If you don’t use it and you don’t know what it’s for, remove it. Never “Blind-install” – always go the “custom” route and un-check any “hitch-hikers” that you see. Never click a link in an e-mail from someone that you were not expecting. Patch common sources of vulnerability, such as Adobe Reader (or remove and replace with Foxit) and Adobe Flash. Do not patch Java – remove and replace it, as “upgrading” auto-installs sneaky hitch-hikers. I am not in a good mood. I spent more than five hours last night troubleshooting and configuring Routers, Cable Modems and Routers *in* Cable Modems. And Time Warner’s alleged Customer Service was no help at all. The story begins at about 21:30, when my home network went down. After some troubleshooting, I determined that my Router – a D-link DGL-4100 – had packed up, possibly permanently. The Cable Modem – An Arris TG-862G – had a built-in router. When they installed this router four months ago, I asked the tech to switch this embedded router off to prevent a problem called “double-natting“. He did so. With my router down and possibly out, I wanted to reverse this process. Question 1: How do I turn the embedded router in the cable modem back on? I called Customer Service and spoke to a woman of foreign extract who did lots of apologizing and asked me all the usual questions. I asked her the question. In spite of my detailed explanation, She didn’t seem to get it, and kept blathering about “wireless”, and I kept having to correct her – this has nothing to do with wireless. Eventually told me that she could not do this, but Technical Support could. She put me on hold. A few minutes later another lady answered. After lots of apologizing and asking the usual questions, I realized that she was not Technical Support, but another Customer Service Dweeb who also could not help me. I was put on hold again. After fifteen minutes of being told how wonderful Time Warner Cable is, I hung up in disgust. After a little trial-and error, I found the solution: Connect a computer directly to the cable modem, browse to http://192.168.0.1 and the password is “password”. I did so, and turned off Bridge Mode – Hurrah! Question 2: How do I reset the Cable Modem to Factory Settings? Against my better judgment, I called back Time Warner. This time I spoke to a gentleman of foreign extract, who did lots of apologizing and asked me the usual questions. I explained to him that I was an IT professional with a complex network (Modem+Router+WAP+two switches+about a dozen different devices) and restated my question. He said “Let me check that on my system” (which I assume means “Let Me Google That For You“), then he put me on hold, and I six minutes later I heard the annoying tone of a disconnected line. I hazarded an intelligent guess, and the gamble paid off. The answer is: Press and Hold the Hardware Reset button on the Cable Modem for twenty seconds. I then logged in, changed the password, changed the IP address and configured the router. So I am back up and running – sort of. The “embedded” Router built in to the Cable Modem is Gigablt – which is good – but it is otherwise crap, as it does not support port forwarding or QoS – which is bad, as it means that I cannot use Wake-On-LAN to remotely start my computer. But it will do for now. If my old router is working, I finally have an excuse to flash it with DD-WRT, and if not, I will replace it. Employ CS people whose first language is English, and pay them for quality (customer satisfaction) not quantity. (number of calls). Empower them to solve problems without putting customers on hold. Hire some decent techs. I am available nights and weekends, but you probably cannot afford me. When someone’s Internet is down, don’t insult them by trying to upsell them to faster Internet. Some people find this offensive. Act like you have competition. You do.